We have decided that because ECS has become so large, we don't have a chance to get to know all the members the way we would like, so we came up with an idea to pick a couple members each month to interview and feature on the blog. This is strickly random and not manditory. If you are picked at do not want to be interviewed that is fine too. All you would have to do is let us know and we will choose someone else. This is a great way to get to know each other and to promote yourself. With that being said, Let me introduce you to: Sandi Bodnarchuk. Sandi is from Tyndall, Manitoba, Canada. Sandi sells on Etsy and Ebay, and would love to have her own website and hopefully that will come soon. She also sells to friendswho knows she always has something available if they are looking for a gift. Sandi's blog is http://www.forheartandhome.blogspot.com/ and you might want to give her a visit, leave a nice comment and see some of the things she has been up to. When asked how she got her start at the sewing machine, I was very surprised and excited to hear the following story: "I started sewing at a very young age on my mother's old Singer treadle sewing machine. I was too small to reach the treadle, so my sister would work it with her hands and I would sew. I would tell her when to start and stop - I have to admit I got my fingers caught more than a few times because she didn't stop in time. "Sandi went on to tell us, "I started by making doll clothes - no Barbie dolls in those days, but I had a tiny doll I kept very well dressed. Then I started sewing clothing when I got pregnant, and made all my maternity clothes. It just progressed from there - sewing for my daughter when she was little, designing and sewing her graduation dress with no pattern. I made it out of an old bedsheet first, then when it got to be what I wanted, I used the real fabric. The most cherished item I sewed was my granddaughter's Christening dress and hat when she was baptized. I have always done crafts of one kind of another. I am the happiest when I am creating and there are a lot of nights that I wake up with an idea and have to suppress the urge to get up and start making it at 2:00 a.m."
This is a very talented lady, Sandi also paints. She is self taught! 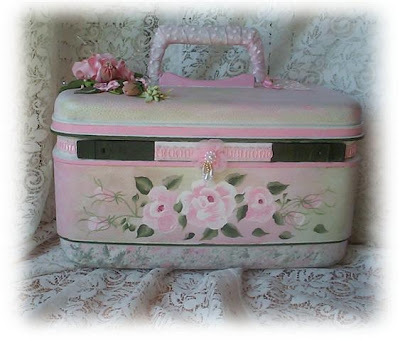 Sandi loves to paint roses on anything that she can find, especially old discarded items. 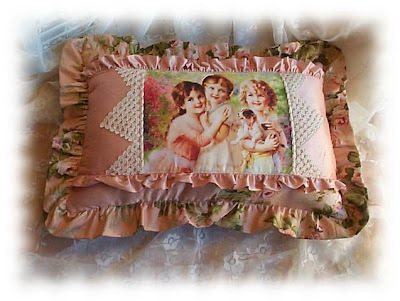 I love to make Victorian inspired items, pillows, sachets, wall hangings, door hangers and totes. I especially enjoy making guest towels from vintage damask tablecloths, porch pillows from vintage tablecloths, Valentine and Christmas stockings, friendship balls, pin cushions, hand bags, market bags, pillows with vintage graphics, rag rugs, hanging sachets, pot holders and embellished hangers. 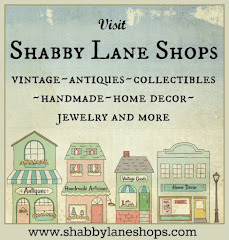 Almost all of my items contain either vintage lace, vintage crochet, vintage embroidery or vintage mother of pearl buttons. I love taking a beautiful piece of fabric and embellishing it with something old that may have otherwise been thrown away.I think one thing that we always love to hear is where artists get their start. "My mother. When I was growing up I didn't have a bought coat until I left home. My mother sewed all of our winter coats and almost everything we wore. She made all her own clothes and in the early years, moms didn't wear slacks or jeans. She always had on a pretty skirt with a matching blouse or a dress. Every Easter she made us new outfits to wear to church and would buy us matching hats and new shoes. My mother had wonderful fashion sense and I hope some of it rubbed off on me. Sandi has been crafting, sewing and painting ever since I have been married and that will be 47 years on June 1st. When asked what Sandi likes to collect, she told us this, " I collect depression glass dishes, pink in the pattern Buttons and Bows (also known as Holiday.) My collection was started by actual pieces that were my mothers that she had received as wedding gifts when she got married, so those pieces especially mean a lot to me. I also collect figurines of old people. I only buy them when we are on a vacation somewhere, therefore meaning something specific to me - a time and a place - a happy memory. Last but not least, I asked her what she has learned or gained from all of this and she told us: I especially cherish the friendships I have made through crafting and selling. I have learned so much from these new friends, be it computer help (I am computer challenged) ideas for creating, and sounding boards and encouragement to put myself out there and try new things. I thank all of them from the bottom of my heart. I hope someday we all have such great success with our crafting that we can afford to meet someplace fun and hang out as girlfriends. What a hoot that would be. I hope you have enjoyed a peek into Sandi's life and look forward to our next interview. Hi. I'm Melody with Brown Gingham Creations. I have been a member of ECS for a year now. Debbi and I were chatting the other day, she thought I had an idea some of you would like to join in on and asked if I'd be a contributor to the ECS Blog. You see I had an idea for a monthly post a while back. A Vintage/Collection Alphabet. Each month I'd write a post pertaining to something vintage I collect beginning with a corresponding letter of the alphabet. Okay, look out, I've been thinking again. I was hoping you all would help me make it more interesting by posting comments with links to your blogs showing others your corresponding vintage alphabet finds. January will be A. My post will pertain to APRONS, but you can show off your Apple collection, vintage Artworks, Aluminum, whatever you can think of, or, show off you apronature(C) and display your own aprons! All you need to do is create a post on your blog, click on the Mister Linky Icon at the bottom of this post, add your link and once that's done we all can visit each others blogs. You can also visit my blog here to read the post. You'll have time to think about this...the post will be up on Jan. 20Th and remain til Monday. We hope to make this a monthly get together, so, after you do this post start thinking of things for 'B' for February! I really hope you can come over and play Wednesday! Don't forget if you have an idea for a blog get-together get in touch with Debbi, it's always so nice to visit. Click on the badge to find out more! 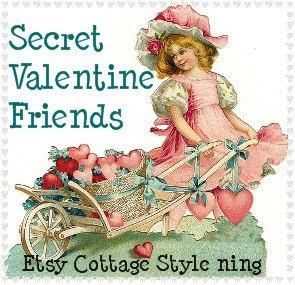 Open to all Etsy Cottage Style ning members!